Yes a new baby is coming! But not for me, for my little sis and her husband Dalton! 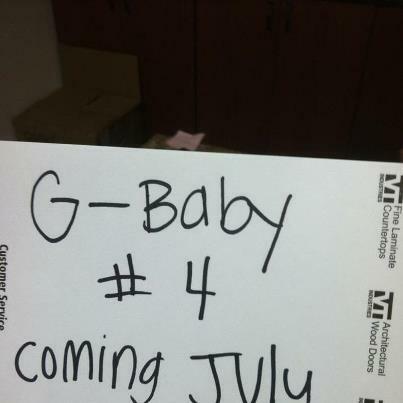 We went into my dads work to tell my dad and my mom, but my mom wasn't working so I decided to write this little note (G-baby #4 coming July 5, 2013) I sat down and told my dad not to be alarmed or mad about what I'm about to tell him. So I handed him the note. He read it for what felt like 5 minutes and said, "G-baby, you're having a boy!" haha we laughed and explained "yes you are going to be a grandpa of 4 g-babies(grand-babies) but not for me, Mykelle!" So it was a good surprise. My parents are excited, as are we!